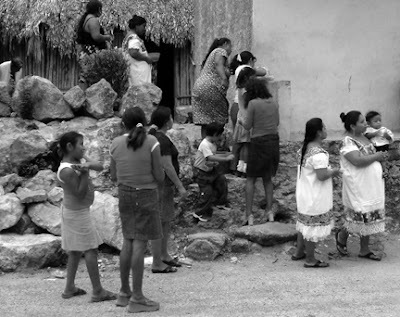 During my thesis research in the communities of Saban and Huay Max, located in the state of Quintana Roo, Mexico, I watched how children from three different familial units living on the same housing lot were constantly reorganized and re-circulated as adult family members came and went. For many rural communities in Quintana Roo, Mexico, child circulation is taking on a new meaning as many young women are joining men and now choosing to migrate out of the community in search of work in tourist and urban centers. The research for this essay grew out of my focus on how young migrant women negotiate the culturally prescribed role of motherhood versus the complex demands they face as economic providers. 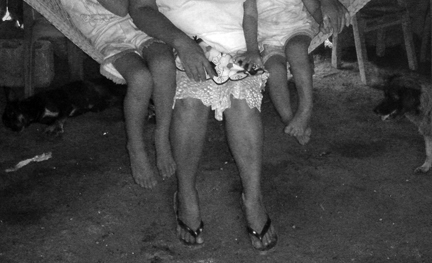 This essay explores how the dual pressures of economics and relocation are affecting Yucatec Maya mothers, fathers, and children. Quintana Roo is a critical part of the tourism development boom that has taken place throughout Mexico since the early 1970s (see Clancy 2001; Castellanos 2010). While tourism development throughout the region generates both revenue and employment, there are also many serious negative social and environmental repercussions to this pervasive form of development (Sanchez-Gil et al 2004:588; Clancy 2001; Hiernaux 1999; Castellanos 2010). Tourism development in Quintana Roo has led to a dramatic increase of internal migration to the coastal regions, which has resulted in tremendous population concentrations that surround well-known destinations such as Cancun. In many of the households that I have encountered over the last several years, a vast majority had at least one member of the family who migrated out to tourists zones in search of work. The social effects and impacts of tourism development are often deeply gendered (Casellas and Holcomb 2001). Although tourism may produce positive and/or negative consequences for women, Casellas and Holcomb point out that the employment women gain from tourism, among other benefits, can improve women’s economic and social positions within their respective communities (2001:162). There is no work here. We have to leave and find work in places like Playa [del Carmen] and Cancun in order to bring back money to pay for our children’s clothes and food. Many other parents echoed Ramon’s sentiments that temporary out-migration was motivated by the need to fulfill parental and familial obligations. This lack of economic opportunities is not an isolated issue; it is a problem faced by many families in the region. Specifically, in rural Quintana Roo, children are being circulated because of the challenging situations that many women and their families face. In the past few decades it has traditionally been males who have been pushed to find work outside of the local community; but this trend has been drastically modified, as women are now starting to migrate out of their natal communities in search of a way to further supplement their family incomes. The main factor driving this out-migration is economic; however ecological changes to the environment have further affected rural communities’ economic needs. 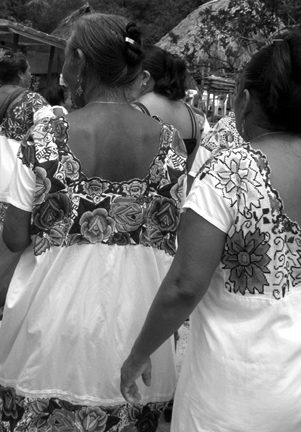 In response to these pressures, there are two primary factors that enable rural to urban migration for women in Quintana Roo: access to higher education and a thriving tourist economy. Emily Walmsley argues that when rural regions become subsumed within wider global markets, “earlier practices of fostering and kinship are continually being shaped by new economic and social pressures” (2008:174). As Walmsley (2008) and Jessaca Leinaweaver (2007) demonstrate in their research, the practice of fostering or child circulation also serves as a survival strategy during times of economic crisis and reinforces kinship ties. In response, families are utilizing a highly dynamic and flexible family structure to facilitate child rearing. In rural Quintana Roo, children whose parents migrate out for work are moved around and primarily sent to live with close extended kin like older sisters, aunts, or grandparents. Although mothers and their husbands are the primary decision makers in determining the fate of the child, children also have a say as to where they choose to live. Sometimes it is the child’s desire to stay behind with family that influences the way in which they are circulated. Such occurrences are illustrative of not only the dynamic nature of the family unit, but also of the fluidity and flexibility of individual agency. The majority of the residents of Saban and Huay Max are subsistence agriculturalists that rely on getting their main food staples from their milpa (agricultural plot). The families in the region have to constantly fight with environmental elements such as drought, floods, and hurricanes. In 2005, Hurricane Wilma (the strongest tropical cyclone on record in the Atlantic basin) had devastating effects throughout the peninsula in particular along the coast of Quintana Roo. Those effects were also felt close to home in both Saban and Huay Max with the complete loss of harvest due to floods and the salting of the fields caused by rainwater mixed with ocean water. During the summer of 2008 the communities once again completely lost their harvests due to drought. I was in these communities in early September when the rains came just two weeks too late. Nothing could be done; the crops dried out and the years’ work was lost. After losing the harvest for the sixth year in a row and experiencing increasing food costs, the economic realities and hardships are undeniable and often seemingly insurmountable for many community members. As a result, many people are temporarily diversifying their modes of subsistence and choosing to migrate out in larger numbers than in past years to help supplement the costs of food, shelter, and clothing for their families. Many new migrants are now women. The majority of these women are in their late teens to late twenties. Those who are married usually have children; these children are often left behind with extended kin while the mothers migrate out in search of work. Because the majority of women who leave the community in search of work are of reproductive age, the well-being and social reproduction of children whose mothers migrate out is an issue of great importance. As women negotiate their absence within their families they incorporate various strategies to help protect their children’s emotional and physical wellbeing. As much as mothers stated that they would like to be with their children, many expressed their feeling that the safety and well-being of their children is more important than their own personal desires, sense of identity, and fulfillment of traditional gender roles. Maribel, a 30-year-old mother who has steadily migrated out for work over the last five years, told me during an interview how difficult it was for her to be away from her children. She explained that she had wanted them to stay and live with her (and her husband) in the city, but knew that they wanted to be back in the pueblo. She understood that her children were happier in the pueblo with all of their friends and family and knew that forcefully making them relocate would have devastating effects on them. However, in choosing to leave her children behind, Maribel felt a sense of loss. Due to her extended migration out of the community, Maribel’s youngest child would sometimes accidentally call her mother “aunt”, which Maribel said hurt her sense of motherhood and the value that she had in the lives of her children. In Maribel’s case, motherhood meant economically providing for her children rather than participating in their daily care. here in the pueblo they can run around and play with other children in the streets. They can stay out all day if they want to. Here they are not confined to a room or a small yard. In the cities it is not safe for children to walk or play around in the streets and that’s why they have to stay inside all day. The children don’t like it and that’s why they choose to stay in the pueblo. The two youngest children that Liliana looks after are four and six, and they have openly expressed their desire to remain in the pueblo. To them the pueblo is their home, where they feel comfortable and safe surrounded by everything they know including their family and friends. They both had the opportunity to live in Chetumal, the capital city of Quintana Roo, with their parents but chose to return to the freedom of pueblo life were they were are able to play and wander around all day. Moving to urban cities, while sometimes exciting for children, can also be a lonely and shocking experience. For that reason, children often decide to stay in their natal community, where the comfort of routine, friends, familiar places, and family is readily available. Community ties are clearly important for children, just as they are for adults. Santiago, Liliana’s teenage nephew said that unlike his younger brother and two older sisters, he chose to stay behind because he didn’t want to leave all of his friends. Access to greater educational opportunities and resources were not significant factors influencing Santiago’s ultimate decision to stay in the community; for him the freedom he had in the pueblo, as well as his established relationships with friends and family, proved to be more important. I watched Santiago frequently move in and out of the house. He spent most of his time outside hanging out around the plaza, visiting the internet café, picking up a game of futbol, or visiting with various friends. Stepping back and looking at how a rural community attempts to cope with increasing economic pressures through the migration of men, and now women, to tourist and urban centers demonstrates the powerful ways in which economic pressures can move bodies. It also highlights the creative and flexible ways in which families adapt to these pressures. In the case of rural Quintana Roo, the out-migration of women has further affected the lives of children, and reshaped socially acceptable norms about how children are positioned within larger family units. For families facing economic difficulties in Saban and Huay Max, the practice of child circulation enables women who migrate out for work to rely on kin relatives like their mothers, sisters, sister-in-laws, or older daughters to help raise their children and provide them with a better quality of life. This results in the establishment of closer kinship ties through the sharing of mothering. Here child circulation functions as a survival and betterment strategy as children are moved and transferred between households. Yet, as Maribel’s experiences demonstrate, female out-migration and the subsequent circulation of children can have difficult social costs for families in places like rural Yucatan. This reality underscores the need to understand the implications of globalization beyond macro-economic perspectives. By analyzing how economic pressures affect the intimate relationships of family and motherhood, we gain a much deeper—and more complex—understanding of the local social meanings and impacts of wider political and economic processes. *All names used in this essay are pseudonyms. Casellas, Antònia and Briavel Holcomb. 2001. Gender, Tourism, and Development in Latin America. In Women as Producers and Consumers of Tourism in Developing Regions. Apostolopoulos, Y., Sönmez, S. F., & Timothy, D. J., ed. Westport, Conn: Praeger. Castellanos, M. Bianet. (2010). A Return to Servitude: Maya Migration and the Tourist Trade in Cancun. Minneapolis: University of Minnesota Press. Clancy, Michael. 2001. Exporting Paradise. New York: Pergamon. Hiernaux, Daniel Nicolas. (1999). Cancún Bliss. In The Tourist City. Dennis R. Judd and Susan S. Fainstein, eds. Pp. 124-142. New Haven: Yale University Press. Leinaweaver, Jessaca B. (2007). On Moving Children: The Social Implications of Andean Child Circulation. In American Ethnologist, Vol. 34, No. 1. pp 163-180.
of the Gulf of Mexico. In Ocean & Coastal Management, Vol. 47, pp. 581–596. Ambiguities in Northwestern Ecuador. In Journal of Latina American and Caribbean Anthropology, Vol. 13, No.1, pp. 168-195.